Church opposition in the Philippines to destructive mining on its islands was supported by Church leaders in Britain on 9 February at the launch of a new report at Westminster titled, Philippines: Mining or Food? It was commissioned by the UK-based Working Group on Mining in the Philippines, which is chaired by Clare Short MP and involves Columban Faith and Justice, the Ecumenical Council for Corporate Responsibility, and Philippine Indigenous Peoples Links. The Oblate JPIC Office is preparing a US launch in the coming weeks. Bishop John Arnold, auxiliary in the Catholic Diocese of Westminster and Anglican Bishop Michael Doe, General Secretary of Anglicans in World Mission, attended the London launch, giving support to the Catholic Bishops Conference of the Philippines and the Philippine Independent Church, which have worked closely with those affected by and protesting against mining companies. Bishop Doe reflected that he has personally known Church personnel, including one bishop, who were murdered because they opposed mining projects. The Canadian Catholic Bishops Conference sent a message of support to the launch, saying, “The Catholic Bishops of Canada continue to encourage their episcopal confreres in the Philippines, and all those who collaborate with them, in their important and timely efforts to protect our planet as a gift from God”. Report authors and environmental experts Clive Wicks and Robert Goodland recommended that new mining is halted in the Philippines and that international investment is withdrawn until procedures are in place to protect human rights and the environment. They provided evidence that the mining of gold, nickel and other minerals is causing large-scale ruin of island environments and people’s livelihoods, particularly undermining rice production and poisoning water. Even whole mountains can be destroyed to access precious minerals, harming the country’s tribal peoples. “Focus on rice production and not on mining,” urged Robert Goodland. The authors joined Filipino campaigners and the country’s Catholic Bishops in calling for the Mining Act of 1995 to be revoked. This legislation opened up the country to exploitation by foreign mining companies. “The Church joins in the collective and continuous call against the uncontrollable plunder of our natural resources,” said the bishops in 2008. “Above all” they added, “it calls for a moratorium on mining activities until the government and the mining companies learn to uphold the rights of the indigenous peoples, compensate the affected communities for past damages, and ensure responsible mining practices”. Victoria Tauli-Corpuz, an indigenous woman from the Northern Philippines and current chair of the United Nations Permanent Forum on Indigenous Issues, also welcomed the report. “Mining is not the path to our development” she said, “and we will be picking up on the report’s recommendations back in the Philippines”. Companies with a British base whose plans for mining in the Philippines are being challenged include Xstrata Copper, BHP Billiton, and Crew Minerals. Clare Short criticised the very substantial role of the City of London in financing large-scale mining in the Philippines, and encouraged investors present at the launch to review their involvement in Philippines mining. 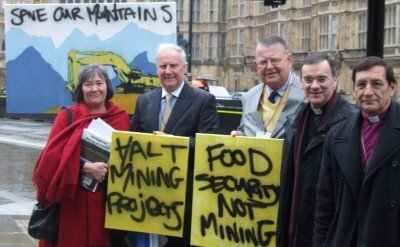 Clare Short MP introducing the 2009 report, Philippines – Mining or Food? Visit to Philippines mining sites during January 2009 for report launches there. The full report and abbreviated version. Philippine Indigenous Peoples Links (PIPLinks) upholds and promotes the collective and individual human rights of Indigenous Peoples and other land-based communities in the Philippines. The Missionary Society of St. Columban, with headquarters in Ireland, has nearly 600 missionaries of ten nationalities ministering in 14 countries, including the Philippines. IUCN-CEESP – The International Union for Conservation of Nature (IUCN) Commission on Environmental, Economic and Social Policy has over 1300 members. They provide expertise on ways to harmonise biodiversity conservation with the crucial socioeconomic and cultural concerns of human communities, such as livelihoods, poverty eradication, development, equity, human and community rights, cultural identity, security and the fair and effective governance of natural resources. The Ecumenical Council for Corporate Responsibility (ECCR) is a membership organisation of the British and Irish churches working for economic justice, environmental stewardship, and corporate and investor responsibility. The Irish Centre for Human Rights (ICHR), based at the National University of Ireland Galway, is dedicated to the study and promotion of international human rights and humanitarian law. Robert Goodland is an environmental scientist specialising in economic development. He advised the World Bank Group from 1978 through 2001. He then became the technical director to H.E. Dr. Emil Salim’s independent Extractive Industry Review (http://www.ifc.org/eir) of the World Bank Group’s portfolio of oil, gas and mining projects. He was elected president of the International Association of Impact Assessment, and Metropolitan Chair of the Ecological Society of America. He was awarded the World Conservation Union’s Coolidge medal in October 2008. Clive Wicks has 48 years of experience of working in engineering, agriculture and environment, specializing in the impact of extractive industries on the environment. He is a vice chair of IUCN-CEESP (IUCN’s Commission on Environmental, Economic and Social Policy) and co-chairs SEAPRISE (IUCN-CEESP’s Working Group on the Social and Environmental Accountability of the Private Sector). He worked in the international environmental movement for the last 24 years, mainly with WWF UK. He headed WWF UK’s African, Asian and Latin American programs, and represented WWF at G8, World Bank, International Finance Corporation, UNEP and UNDP meetings on extractive industries. Victoria Tauli-Corpuz is currently Chairperson of the United Nations Permanent Forum on Indigenous Issues which meets annually in New York. Victoria originally qualified and worked as a nurse in her native Philippines before becoming an activist for Indigenous Peoples rights. She herself is a Kankanai Igorot from the Cordillera Region of the Northern Philippines. She is the Executive Director of Tebtebba Foundation which is a research, education and advocacy NGO working on Indigenous issues. She is very concerned on Mining issues and food security and Tebtebba is a leader in research and documentation on these matters as they affect indigenous peoples not only in the Philippines. Victoria was one of the Joint Chair persons of the Indigenous Peoples Caucus that worked with state representatives at the General Assembly of the UN to ensure the passage of the UN Declaration on the Rights of Indigenous Peoples in September 2007. She is a well known and respected Indigenous Rights activist with more than 30 years experience of working on these issues. In the UK she is anxious to promote awareness of the UN Declaration on the Rights of Indigenous peoples and press for its active implementation by Government, Business and civil society groups. Her current work with Tebtebba is in liaising among South East Asian indigenous peoples organisations in recording and voicing their shared concerns and recommendations on climate change and climate change mitigation measures as they impact on Indigenous Peoples.